Here’s what’s up in the world of TV for Friday, December 23, and Saturday, December 24. All times are Eastern. 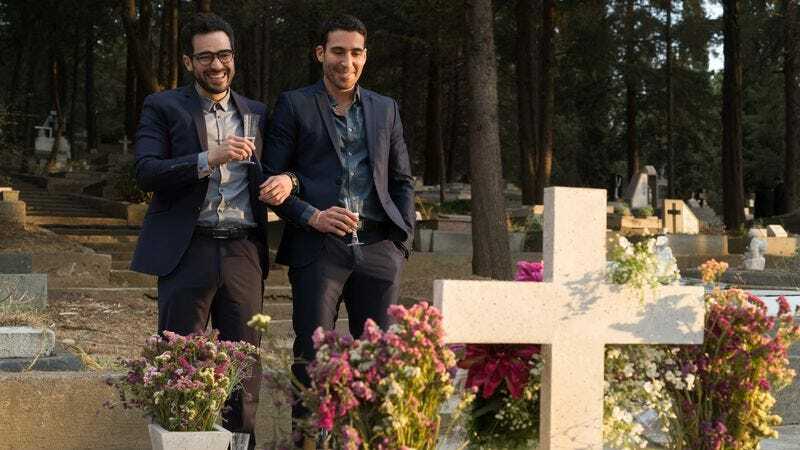 Sense8: A Christmas Special (Netflix, 3:01 a.m., Friday): The second season of this mind-sharing sci-fi drama from the Wachowskis doesn’t come out until May, but fans get an early holiday prezzie with this two-hour special. The episode description gives essentially no information! See? But that synopsis pretty much sums up why people like the “joyous human connection” of Sense8 in the first place, so that’s probably a good sign. A Home For The Holidays (CBS, 8 p.m., Friday): Singers Miranda Lambert, Alessia Cara, Rachel Platten, and others perform in this annual special that celebrates the generous joys of adoption. Featuring a number of families from across America who have taken kids in need into their lives, it’s the holiday spirit at its most unassailably nice. The Great British Baking Show: Christmas Masterclass (PBS, 8 p.m., Saturday): It’s the last of the two of this year’s always delightful and delicious GBBS holiday specials, with Paul, Mary, Mel, and Sue (and some favorite past contestant bakers) joining together for one final showstopper. Travelers (Netflix, 3:01 a.m., Friday): Netflix picks up this Canadian sci-fi series about a team of time-travelers from the future who’ve come back to save us from an impending, world-shattering catastrophe. Frankly, they’re about a month and a half too late, but thanks for the effort, time-travelers. Trollhunters (Netflix, 3:01 a.m., Friday): No-doubt visually stunning animated series from Dreamworks and Guillermo Del Toro’s Cha Cha Cha Films features the voices of Steven Yeun, Ron Perlman, Kelsey Grammer, and—just to bum you out—Anton Yelchin, in his last role. In it, a kid becomes the defender of all trolls, which doesn’t sound like he’s actually hunting the trolls, but Del Toro knows what he’s doing, no doubt. Terry Crews Saves Christmas (CW, 8 & 9 p.m., Friday): Human cheer-muscle Terry Crews wraps up his series of holiday specials where he bursts in on various families to make sure they have the best Christmas ever. Seriously, having Terry Crews just show up to hang out for a while would probably make for the best holiday surprise ever, but, here, Crews also brings presents and hams and so forth. Shakespeare Live! From The RSC (PBS, 9 p.m., Friday): On the 400th anniversary of his death, those Shakespeare kooks at the Royal Shakespeare Company trot out this extravaganza celebrating Shakespeare’s plays and “his influence on music, dance, and opera.” All Shakespeare, all the time, people. …settles in for a long winter’s nap. Happy holidays, everyone. Rick And Morty, “Anatomy Park” (Hulu): Feel like your blood is congealing into plum pudding thanks to all the sweet holiday songs, specials, TV movies, commemorative mugs, carolers, and actual, sugar-based treats? Well, a Dan Harmon series is always going to mix in some welcome, fibrous bitterness with the gooey fruitcake. This first-season episode—where mad scientist Rick builds a miniaturized theme park inside an unfortunate, Santa suit-clad homeless man—is as darkly inventive as it is completely bananas. There’s even a dollop of real heart in there, as Jerry’s parents (and their suspiciously kind and youthful Christmas dinner guest) reveal just how far people can go to find happiness—even if it involves a Superman costume.